Super Simple Landing Page and a clean flat landing page for business template. This template built with fully responsive flat design, Bootstrap, HTML5 / CSS3 , Newsletter subscribe form and more..
You can use this template as a landing page, online portfolio for creative folks or even as a business theme. Support for all modern browsers (IE9+, Firefox, Chrome, Safari, Opera). 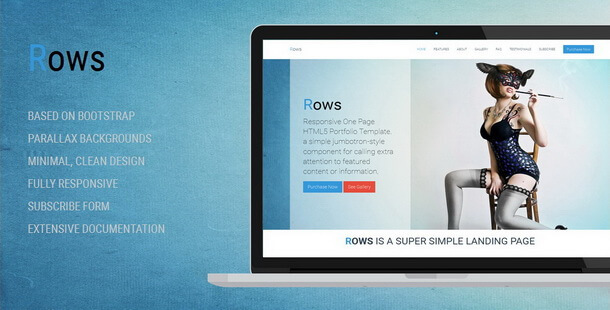 Rows has been coded with care and by keeping performance best practices.